Let's start this the right way. Spells as usual (see spell list below). To cast a spell costs (spell level times 3) Mana. You may use half the Mana costs to cast a spell with half it's effect. You may use double of the Mana costs to cast a spell with 1.5 of it's effect. As long as you have Mana, you may cast any spell you have memorized, but any Mana you used without actually having it will reduce your Hit Points by that amount (last resort, sort of). Mana regenerates after 8 hours of undisturbed sleep. You may attempt to counter a spell if you are faster (Ini) than the casting MU and recognize the spell (via INT-check or any skill, if applicable). You have to use the exact amount of Mana as the casting MU (or more than that) or your counter failed (the Mana would be lost). To activate a spell on a scroll is 1 Mana per spell level. With the Mana costs at spell level x 3 he couldn't cast more than he actually would with the classic rules, but he is much more flexible in his casting. What Spells on Level 1? It's a mix of spells from the D&D Rules Cyclopedia and AD&D. All missing spells might be around, but that's what you get. Basic Spells means they have it always memorized (without using a Spell Slot) because it was an essential part of their qualification as a wizard. They should be able to use important spells like Read Magic. Cantrips (1 Mana per Cantrip) are nice flavour for THE GAME. My thinking, anyway. I discarded any spells a MU could use to fortify some physical ability (be it Spider Climb or Jump) on purpose*. The MU, as I would like to have him in my game, manipulates the physical world to achieve his goals, not the other way around. Feather Fall is disputable in this, but there is a difference between a guy casting a spell to climb a wall (a physical action) and a guy casting a spell because he lost his footing (desperation). The rest as usual, please! For progression, hit points and spells per level I use the Rules Cyclopedia. As a courtesy I give them for every +1 INT bonus one more spell (a +3 would mean one more spell for the first 3 spell levels, etc.). It's not the only way to present the MU in a D&D game, but it's the way I prefer it. I hope there are a few new ideas or perspectives, though. * The MU in my group commented this with: Why use Jump if you can fly in style? The OSR made me do it! Especially this guy. But it's no new idea to customize Classes in an RPG or even to build new Classes to make the players happy. As a regular feature in my Campaign, players may unlock new Classes (it's just my fancy way to give them the feeling they've achieved something...). There are already two examples on this blog. 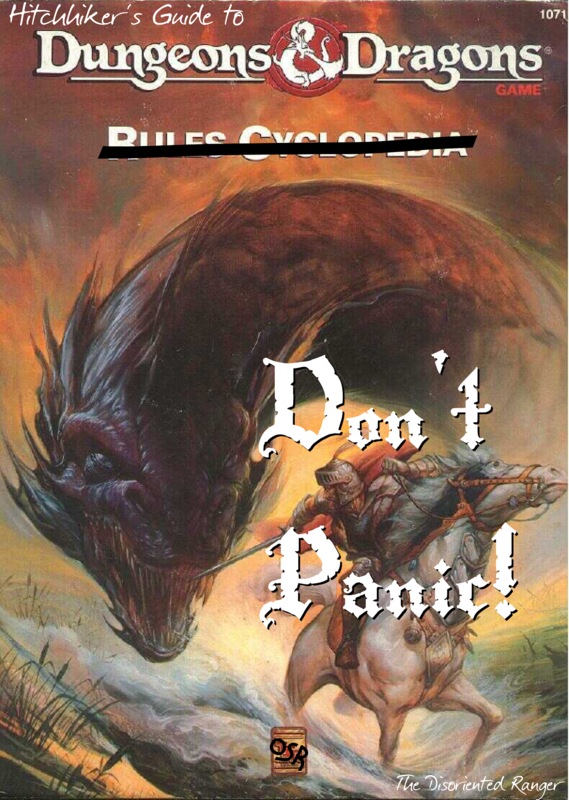 For this series I would like to talk about the basic Classes in the Rules Cyclopedia, though. Like, my view on the Thief, why should a MU have Mana, Cleric spells at 2nd level (but...), this sort of thing. And when I started thinking about this, I considered linking some Black Sabbath to it, you know, for flavour. And soon I realized it's ALL Black Sabbath! Well, it wasn't that easy after all. But very Old School. Next will be an intimate look into the Wizard (Spell lists, Arduin Mana and Cantrips to blow funny smokerings). A 3D map of a giant petrified Purple Worm with a Mad Wizard in it? Sounds cool? Check it out over at prekomorec!